For more than 40 years, Gredico has been a prominent footwear sourcing agent and wholesaler, representing the largest footwear providers and retailers in the world. We specialize in the importing and the wholesaling of men's, women's and children's private label, licensed and brand name footwear. Our business has seen dramatic growth over the last few years as a result of strategic retail and wholesale alliances, a strong independent account base and the infusion of a new management team with new ideas and an aggressive strategic plan for growth. Our expansion transcends overseas with two offices in China . A staff of approximately 30 manages production, source innovative materials, quality control and export logistics. At Gredico Footwear Ltd., we partner with our customers to develop effective product marketing and presentation strategies. This service is provided by our in-house full service marketing, licensing and creative departments. Gredico Footwear Ltd. is our landed wholesale division. We import, land and warehouse the product for our customers. The crown jewel in Gredico's portfolio is the performance of its Branded Sales Division. The division is presently overseen by National Sales Managers in both Canada and the United States and supported by a customer service team and a sales force of 20 sales professionals across North America . Gredico has grown its account base to over 500 active accounts by expanding this base to include clothing and specialty retailers. This base has grown due to Gredico's insistence on quality merchandise, on time deliveries, a high level of customer service and our ability to provide in-stock and in-season replenishment by size. 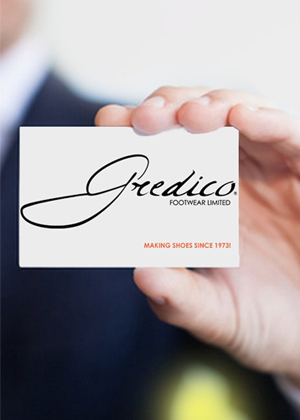 Gredico Footwear Ltd. is privately owned, with an excellent reputation in the footwear industry for quality and reliability. With our strategically located home office and satellite centres across Canada, we are well positioned to distribute all types of footwear. At Gredico, distribution means far more than shipping products to retailers. We understand the complexity of getting the right orders, to the right customers, at the right time, while adhering to individual retailer compliance standards. We’re also skilled at returns management and can facilitate returns, regardless of scope. Do you want us to manage consignment returns? How about managing web sales returns? At Gredico, we’re not just experts at footwear distribution, we’re entrepreneur’s. Marketing and sales collaborate to generate income, which represents the fuel for any business engine. Perhaps you’re looking for a team to execute on your marketing plan throughout Canada. Maybe you recognize differences in the Canadian brand landscape and want a team to generate and manage a brand marketing plan that capitalizes on our extensive knowledge of Canada. The Gredico Entrepreneur’s understand the importance of maintaining sales representation nationwide. We recognize that Canada is one country with key regional differences. The Entrepreneur’s have rich relationships with the top footwear retailers in Canada and we’re here to help. Understanding that one size does not ‘fit all’, we offer our clients an a la carte menu, allowing for the construction of a custom tailored service package. This means that clients can choose the exact front or back office support functions that they require. Clients who aren’t exactly certain about what they will face in Canada can begin by considering a number of service bundles. In our experience, clients often find a service bundle that represents a perfect fit.